Before arriving in Sillikers, New Brunswick, I knew even less about the Miramichi River than I knew about salmon, which wasn’t much. During my one previous fly-fishing attempt, I’d landed branches, hats, even a nearby canoe, everything but a fish. That’s not something one brags about over scrambled eggs and sausage while sharing a table with the sport’s disciples. Debby Norton, who with her husband, Dale, owns the Upper Oxbow Lodge wasn’t deterred by my ignorance. She promised that even if I didn’t catch a salmon, I’d understand the lure of the Miramichi. Norton, the fifth generation of her family on this land, has renovated the riverside lodge and cabins and added hotel-style rooms and contemporary amenities. 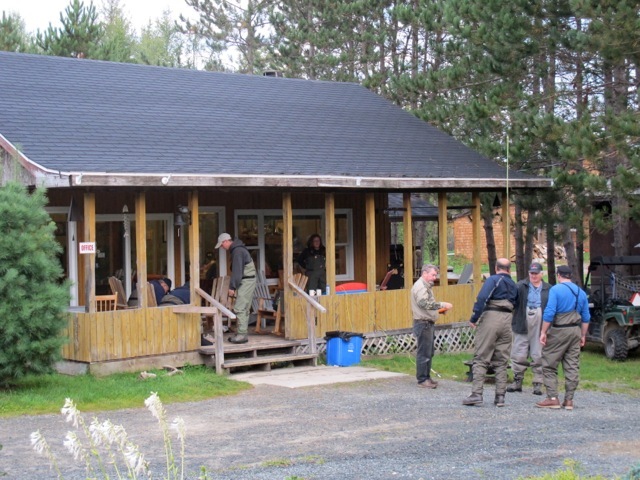 Anglers come from around the world to Debby’s lodge, eager to cast their line in the Miramichi’s famed waters. Historians estimate that Miramichi runs once numbered one million salmon. Even now, the river, which comprises two branches, Northwest and Southwest, and 37 major tributaries fed by more than 7,700 streams, is still one of the world’s largest producers of Atlantic salmon. I was hoping to hook just one. Before becoming one with the river, Betty invited me to join her in making an offering to the spirits. We bowed our heads and sprinkled a little tobacco on the water, watching it swirl away in the rippling water rippling water. I breathed in the heady scent of decay mixed with renewal, and listened to the gurgling chorus backed by the breeze whispering through the maram grass and the occasional splash of a jumping fish. Before I’d even cast a line, I was smitten. With Betty’s guidance, I settled into a rhythm, making a few casts then taking a few steps, working my way from one hole down to another. She sat on the riverbank, quietly offering encouragement and advice, wading out to assist when I needed help. The hours passed quickly. Over lunch back at the lodge, a father and daughter who’d come for a half-day adventure gushed about their experience, despite returning fishless. That’s when I realized it was the quest, more than the capture that defined fly-fishing; it was about being in and of the river. After lunch, Betty offered to take me to visit a place that’s sacred to the Mi’kmaq people. “This river has sustained my people for more than 3,000 years,” Betty said, as padded along a rough, unmarked trail leading to a burial mound, where archeological excavations had documented that history. I took neither notes nor pictures; instead I simply absorbed the silence and the stillness. When I later began peppering Betty with questions, she suggested we visit the museum. 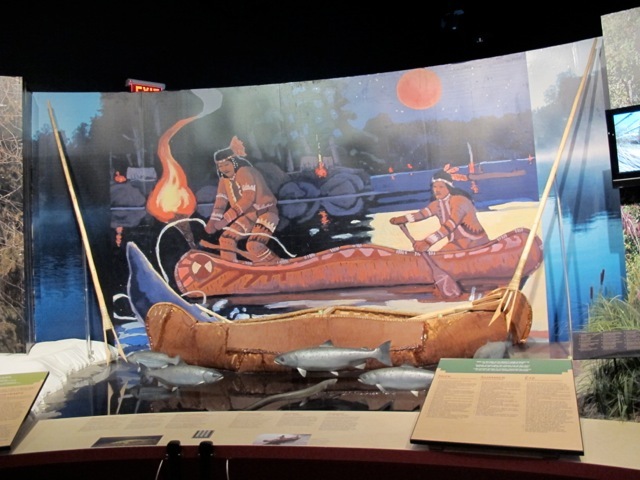 I expected a small, homespun, historical society-type museum, but the Metepenagiag Heritage Park was spectacular, interactive and engaging, with informative displays about Mi’kmaq history and culture, from 8000 BC to now. I could have spent hours here, but Betty reminded me we had a fish to catch. And release. “No one ever told me to release my fish after catching it, I just knew. She was so beautiful and she knew where she was going,” Betty said. “I believe that if I take care of the fish, they’ll return to me. They’re just loaned to us, like children, they’re not ours, they come from God.” Pondering that, I returned to my rhythmic casting dance. Now, I understand the allure. 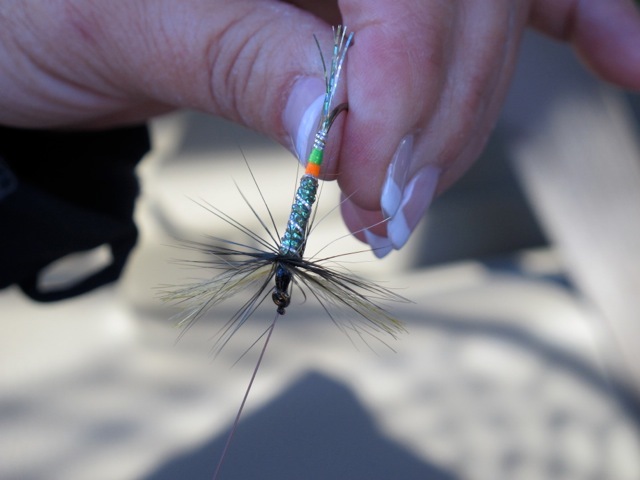 Fly-fishing is a lesson in patience wrapped in a mental competition between angler and fish. Can I outsmart him? Can I fool her into taking a fly, and if so, which fly? The sun lowered in the sky, the river took on an inky hue, and yet, I continued, my determination increasing with each cast. I was exhausted, my arm shaky, my casts sloppy, but I kept at it until Betty called quitting time. Although I didn’t catch a fish, I got hooked. 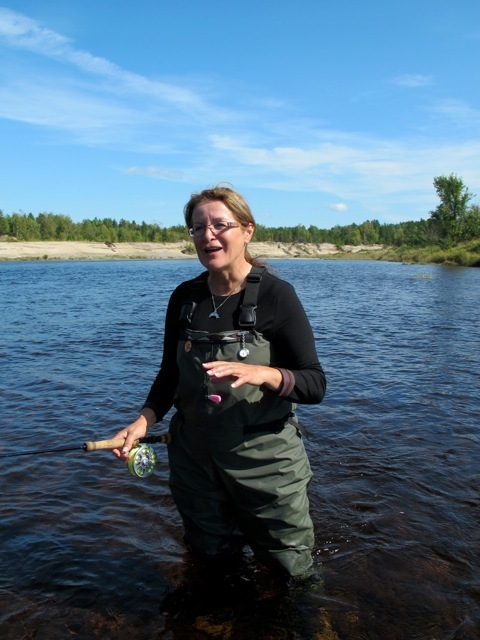 If you go: Fly-fishing on the Miramichi River requires a licensed New Brunswick guide. Upper Oxbow Outdoor Adventures offers a half-day adventure with a professional guide, including gear, license, and dinner. 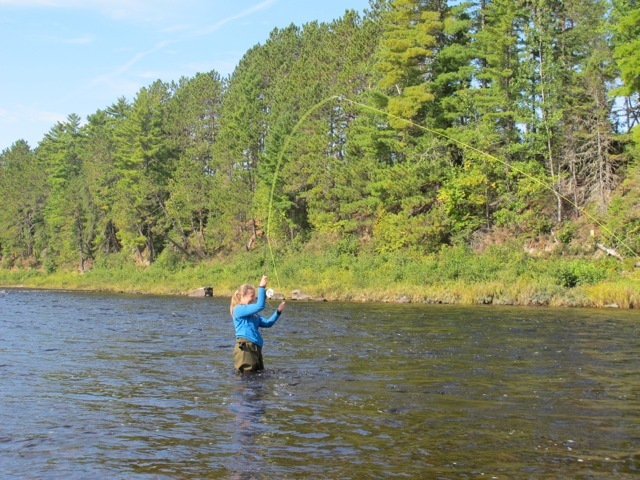 Tags: fly fishing, Miramichi River. Bookmark the permalink.